Escape everyday life and experience your own taste of paradise, where the waves lap the shore, winds caress the palm trees and the water is an enchanting cerulean blue. 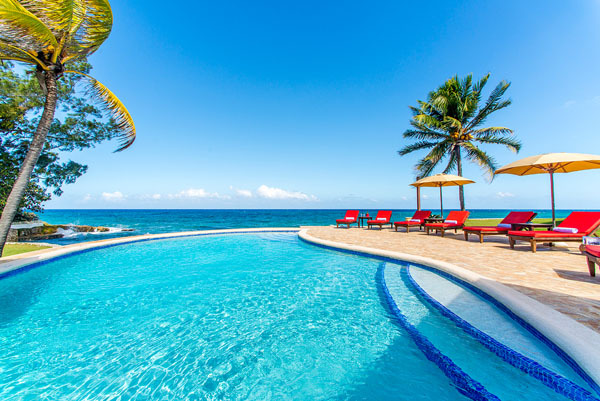 Karma Bay at the Tryall Club offers guests a stunning waterfront location directly on the Caribbean Sea. Jamaica is the Caribbean country crammed with alluring beaches and mountains hiding magical caves and exotic trails waiting for you to discover. The musical roots of this tiny island will have you singing songs from the heart and counting steps as you dance to the beat of the drums on pristine white sand beaches by the fire. Guests can choose from one of six private bedrooms from the magnificent waterfront villa that blends influences from Asia and the Caribbean together with energetic colors and an emphasis on luxury living. Each bedroom is furnished with a cozy king size bed, cable television and a luxurious ensuite bathroom with a walk-in rain-head shower. As for food, the resort offers several dining options. The Organic Garden is tucked away at the end of Calypso Way and neatly surrounded by a picket fence, plantains and bananas. Guests will savor the freshest produce in colorful and creative menu items that makes use of fertile Jamaican land, with choices that also celebrates the ocean. The Great House is also an ideal place for pre-dinner drinks, whether it be inside or outside the terrace. Diners can indulge in a range of teas, assorted sandwiches and pastries. The comprehensive range of cocktails includes a premium Jamaican rum with various vintages from Appleton Estate, which is guaranteed to open your palate. The Beach Restaurant is a relaxed and informal lunch and dinner venue offering a choice of indoor and outdoor seating. It is the perfect place to head to after a morning on the beach, a deep sea fishing trip or a round of golf. The constantly changing menu includes a choice of daily specials created by coveted executive chef Salvatore Cusimano. The menu incorporates fresh produce grown in the organic garden and includes items such as black river crab cakes, Jamaican nachos, angus ribeye steak and catch of the day. Relax and unwind with a luxury spa treatment, including deep tissue massages to release tension, rejuvenating facials that will have your skin glowing and full body relaxation sessions with ocean views. If you like to keep your personal fitness in check, the gym is well equipped with state-of-the-art machines and offers guests ocean views. Yoga is a great way to keep in touch with your wellness, and qualified instructors are available to help you reach your best posture. 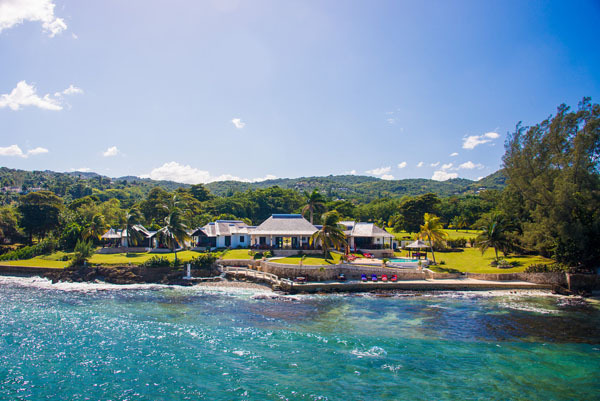 The villa is a brief stroll away from the club’s private white sand beach and the legendary Tryall golf course, which is among the most beautiful courses in the world. Its 18 hillside and seaside fairways have been home to Johnnie Walker and other PGA championship events, and the resident pro offers workshops and private lessons to get you swinging like a pro. If golf isn’t on your mind, the beach is at your complete disposal, and includes kayaking, snorkeling, hobbie cat, glass bottom boats, and charter fishing expeditions. The beach bar is also a perfect place to have lunch or sip on cocktails while you soak up that sultry Jamaican sun. For the adventurers, there are marked hiking trails leading to beautiful views of Jamaica’s best or go sunset horseback riding and swimming for a truly amazing experience.